Heart disease is one of the most death causes which can be found in the world. Of course, for many people heart disease is not something which can be found instantly. It becomes the result of the unhealthy lifestyle. Nevertheless, it is pretty hard to protect their body especially their heart nowadays. With the very busy lifestyle, it is difficult for people to prepare healthy foods. Yes, healthy foods become the key for keeping the heart healthy. 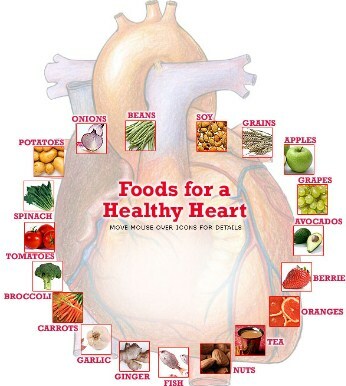 If people want to make sure that they have healthy heart for long period of time, they need to consume these foods. The first food which people should eat for keeping their heart healthy is bean. The heart can be kept at its optimal shape simply by eating half cup of beans in daily basis. Beans can provide great benefits for heart because it comes with soluble fiber. This kind of fiber is useful for binding to the cholesterol so it will not be absorbed in the gut. It means that there will not be bad cholesterol level which can be found in the body. There are various kinds of bean which can be chosen for varying the menu including white, pinto, navy, lima, kidney, and black beans. Besides the soluble fibers, people can also find B complex vitamins, magnesium, folate, calcium, and omega 3 fatty acids in beans and those are great for heart health. Using margarine or fatty oils is very common for people when they are cooking food. If they want to make the meal friendlier to the heart, they should replace them with coconut oil which comes with healthy fats. The healthy fats will be used as energy source instead of stored as body fat. Coconut will also be great for health because it comes with antioxidant, antiviral, antimicrobial, antifungal, and anti-inflammatory properties. Because there is no cholesterol which can be found in coconut oil, it will be perfect replacement for butter. Besides for heart health, coconut oil will also be great for makeup remover, conditioner, moisturizer, and even easing diaper rash. People should avoid savory and sweet treat if they want to keep their heart healthy with no clogged arteries. They can choose low fat yogurt for their healthy snack which is also useful for protecting heart. It is useful for preventing gum disease which is associated with increasing heart disease risk. With other great nutrients packed in low fat yogurt, overall health benefits can be found from low fat yogurt.